Tens of thousands of dollars have been raised online for the family of Eric Garner – who died via chokehold at the hands of New York police last year. The family, however, claims they don’t know where the money is from 19 crowd-funding projects. A quick review of some crowd-sourcing efforts for the Garner family include an Indiegogo “Fund for the Children of Eric Garner” ($44,567), a Fundly campaign called the “Eric Garner Family Support Fund” ($74,684) and two GoFundMe campaigns – one to “Help Eric Garner’s Widow” ($1,675) and another “Support for Esaw Garner” fund ($9,301). Unlike in Kickstarter campaigns, where the amount raised can only be dispersed after a set goal is reached, sites like Indiegogo and GoFundMe can dish out cash as it comes in. 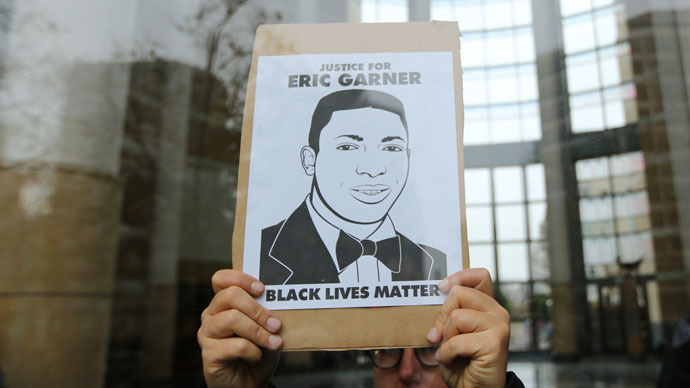 In the case of Garner’s family, members have yet to receive anything – and they don’t know where the money is going, according to a new report by DNAinfo. "I feel like people are trying to use my father's name for their own gain," Erica Garner, 24, told the website. She said she's looking into legal action against the various campaigns not affiliated with the family. "It's unfortunately a sad situation." Garner, a 43-year-old father of six, died July 17 on Staten Island after police used a chokehold in an attempt to place him under arrest on charges of allegedly selling untaxed cigarettes. A grand jury failed to hand down an indictment against the officer involved in the incident, resulting in a month of citywide protests. Several organizations, including the New York Civil Liberties Union, the New York Post and National Association for the Advanced of Colored People are seeking to have jury records released. One of the GoFundMe campaigns, “Support for Esaw Garner,” was put up by an advocacy group called the Charlotte Activist Collective and is trying to raise $1 million for Garner's widow, Esaw Snipes. "We've been in touch with Esaw Garner and she supports our fundraising efforts!" organizers wrote on their bio page. Snipes herself could not be reached for comment, but Erica Garner and her grandmother Gwen Carr had never heard of the fund. A spokeswoman for GoFundMe declined to discuss the fundraiser but said the Garner family could contact the website directly. Nevetheless, GoFundMe has given a written comment to RT stating that Snipes has confirmed to them she has received the raised money from the “Support for Esaw Garner” campaign. Officials from Charlotte Activist Collective, which has only raised $9,301 of the total desired, did not respond to emails or messages on their Twitter and Facebook accounts from DNAinfo. In a related crowd-funding story, the “Detroit Walking Man” who trekked 21 miles to and from work each day received a great deal of attention and a sudden outpouring of donations online. Some $350,000 was raised for James Robertson after his story made headlines around the country, and a local Ford dealership gave him a brand-new 2015 Ford Taurus to speed up his commute. Shortly afterwards, however, Robertson said he received death threats and his girlfriend and her ex-husband started pressuring him for a payday – even though he hasn’t received the money yet. Before long, he was packing up his belongings under police protection and is living in a half-way house while he finds someplace closer to work to live.